A new year means a chance at a clean slate, new goals and the opportunity to grow and improve your life with both new and old resolutions. The Marist Institute for Public Opinion created a poll that asked participants questions about their 2018 New Year’s Resolutions. The top two New Year’s resolutions for 2018 are be a better person and lose weight. Other popular resolutions include eating healthier, kicking bad habits and finding a new job. Only 50% of people who made New Year’s resolutions stuck with them during 2017, so our New Year’s resolution for 2018 is to invite you into our HOPE family and help you accomplish your resolutions! Be a better person by becoming a face of HOPE in your community and lead by example. Kindness and generosity are contagious! We are a small organization with a large footprint! In 2017, we held over 300 events all throughout the United States to support service members, veterans and military families through fundraising and programmatic partnerships. With only 59 HOPE staff members, we need your help to grow our volunteer network! For the same price you spend each month on Starbucks coffee or to eat out for lunch, you can make a difference in the lives of veterans and military families, by joining our monthly giving program, Circle of Hope. Be a better significant other, friend, or parent, by taking care of YOURSELF! Hope For The Warriors Health & Wellness programs provide clinical support to not only veterans but to caregivers, spouses and families. Our programs offer a holistic, person-centered approach in addressing the physical, psychological, social and environmental needs of the service member, their family and families of the fallen. Be a face of HOPE by referring a veteran and military family in your community to our organization. Pass along the information they need to apply for services. A simple button click on our website not only gives them the opportunity to learn about our support programs, but also the chance to connect with other families through our many events. Learn more by clicking here. Run For The Warriors® is a series of community-based races dedicated to the men and women injured in Iraq and Afghanistan, their families and families of the fallen. It is a celebration of their strength and resolve and a promise to continue restoring their sense of self, family and hope. This year we are excited to announce that we’ll host seven Run For The Warriors races! Visit Run For The Warriors to discover a race in a city near you! If running a 5K is one of your 2018 goals, check out our 10-week 5K Training Series for Beginners! Registered Dietitian and Personal Trainer Katie Henry designed a custom training plan for our Run For The Warriors runners that will guide you through training for your first 5K and provide you with healthy eating tips to properly fuel your body. Team Hope For The Warriors® provides athletes of all abilities the opportunity to engage the competitive spirit at endurance events. Warrior Team members are provided adaptive equipment and race support to ensure that they are defined by their achievements rather than their injuries. Community Team members challenge themselves to raise funds for America’s heroes, set new athletic goals, or simply support our military. These teams are united by the common goal to improve the rehabilitation of wounded service members and military families. 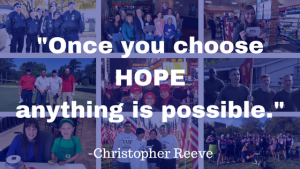 Follow Hope For The Warriors on Facebook to learn more about Run For The Warriors and Team Hope For The Warriors fitness opportunities and events. You can achieve your goals in 2018. Your HOPE family is here to cheer you on and support you every step of the way! If you are a Post-9/11 veteran, caregiver or family member who is interested in learning more about our comprehensive programs, apply for services on our website.